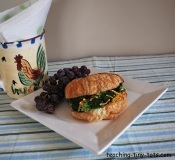 Toddler Recipes: Home Lunch Ideas for Kids, Meals, Snacks, and Best Containers! 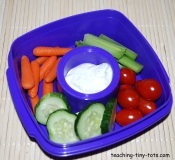 Want to make home lunches for your child? Here is a list that will give you some ideas. Some of these suggestions are perfect for the health concious parent but we have also added ones we think most children will enjoy. If you have a homemade version of soup, chicken nuggets, or fish sticks... feel free to submit it to Teaching Tiny Tots. Please check with your child's school or day care to see if there are children who are allergic to peanut butter! Toasted Bagel with pepperoni and melted mozzarella cheese. Homemade Lunchables with crackers, cheese and deli meat cut out with small cookie cutters. If you use a good thermos like the Thermos Brand Funtainer you can heat foods in the morning and it will still be warm at lunch. We tried other brands and it didn't stay nearly as warm. Fill water thermos the night before and refrigerate to keep colder. Vary the type of bread you use. 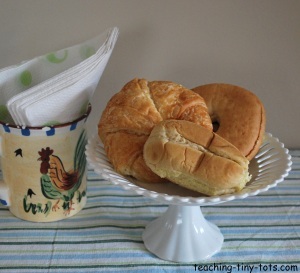 Try croissants, mini buns, hoagies, french bread for variety. 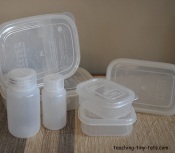 Use BPA free containers instead of plastic baggies...green tip! Add a little lemon to keep color fresh on cut apple slices. 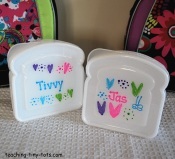 Decorate containers with paint pens to keep lunch fun. Test new lunch ideas at home first!